Yay, baseball. I went to a game last night so I was in the mood for it. It was just a little minor league(Class A to be specific) game but those are nice. I mean I could never afford seats like I had at a Major League game. Right behind first base. Literally two rows of people between me and the game. Anyways I gave this guy a heavy set, wider than my usual style. You know, since he's a tough guy who can knock the ball right outta the park. His uniform is blue, because it didn't look match up with any of his other colors. 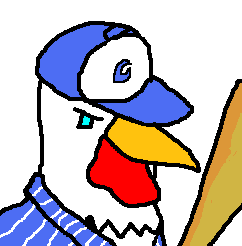 The 'C' on his hat is, of course, for Chickens. The Chickens' game was so hot, the Geese started flying north. This, of course, led to an overwhelming victory on the part of the Chickens.